In a time when women were expected to be quiet, demure, and obey their menfolk, tomboyish Lady Marian chafes against these restrictions. After all, she’s a better bowman, fighter, and rider than half the men around her. Only one man accepts her as she is: her betrothed, Robin of Locksley. When Robin is killed while on crusade in the Holy Land, Marian plunges into the deepest grief. But that’s only the beginning of her troubles. The Sheriff of Nottingham’s man, the lowborn Guy of Gisborne, is given Robin’s lands and wants Marian’s hand to complete the package. Still too raw to even contemplate marriage, she nevertheless rouses herself from her grief to help her maid’s unjustly accused brother, Will Scarlet, when he’s fleeing the Sherriff’s men. Because she disguises herself in Robin’s old hooded cloak, Will reports that Robin is alive and helping his people. And the people desperately need his help. True to the classic Robin Hood legend, Prince John and his creature, the Sherriff, have overtaxed peasants and nobles alike, bleeding the countryside dry. Marian’s heart goes out to Robin’s people, and she decides to adopt the Robin Hood persona and right some wrongs. No superhero, Marian is riddled with self-doubt and fears being revealed. Still, she persists in playing the bold robber and champion of the poor and downtrodden, gaining confidence with each escapade. Throughout, Spooner deftly paints a portrait of a woman born before her time and coming to enjoy the borrowed freedoms her secret identity provides. Frequent flashbacks to Marian’s time growing up with Robin ground this retelling in the original legend and lend it plenty of heart. The emotional core of the tale is amplified by Marian’s growing attraction to the chilly Guy of Gisborne. Though he may not be as brutal and uncaring as he seems, nevertheless, he’s dedicated his life to catching and killing Robin Hood, so no relationship is possible between them. The action builds to a head as the sheriff and Gisborne set a trap for Robin/Marian at an archery contest everyone thinks the outlaw cannot refuse. Although Marian finds her heart divided, she cannot turn her back on her people and dash their hopes. Will Gisborne catch and unmask her, or will she find a way to continue living free and helping her people? Spooner spins a lively tale, loaded with surprising twists and cliffhanger moments. 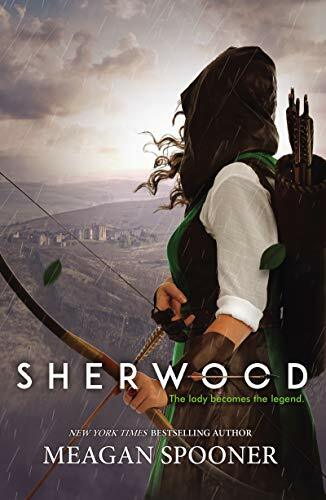 She does an excellent job of bringing the late medieval era to life while still crafting a character that modern readers can relate to. Recommended for all fans of swashbuckling action told with heart and panache.